We are very excited to announce our keynote presenter, Vu Le! 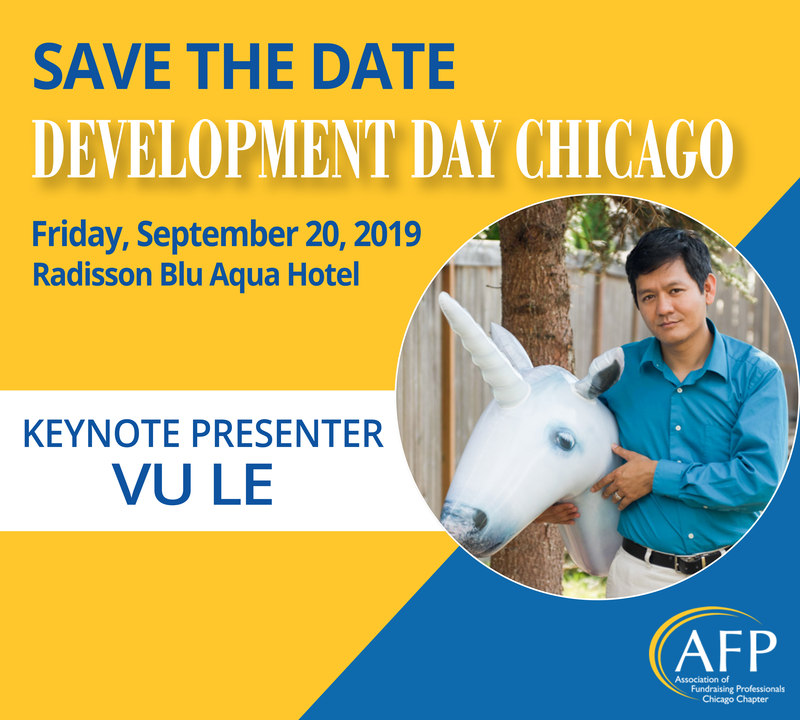 AFP Chicago's premier learning forum is back and better than ever! We are very excited to announce our keynote presenter, Vu Le ("voo lay"). Vu is a writer, speaker, vegan, Pisces, and the Executive Director of Rainier Valley Corps, a nonprofit in Seattle that promotes social justice by developing leaders of color, strengthening organizations led by communities of color, and fostering collaboration. Known for his no-BS approach, irreverent sense of humor, and love of unicorns, Vu has been featured in hundreds, of his own blog posts at NonprofitAF.com. AFP Chicago is proud to announce that Channing Lenert, MS, CFRE, recently named as program officer for Polk Bros. Foundation in Chicago, IL, has been selected as one of the Association of Fundraising Professionals' (AFP) 2019 Outstanding Young Professionals. Channing was recognized on Tuesday, April 2nd in San Antonio, TX at the AFP International Conference on Fundraising (ICON) during the Closing General Session. 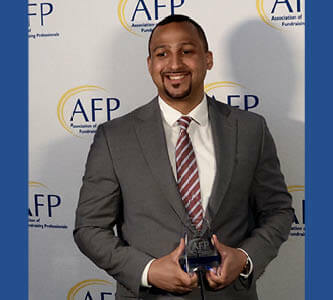 For over 40 years, AFP Chicago has honored the committed, passionate individuals and corporations who work on behalf of the nonprofit organizations that AFP Chicago serves. AFP Chicago is pleased to honor those who demonstrate high ethical standards and exemplify the philanthropic spirit of our great city. The award recipients will be recognized for their outstanding contributions at the 2019 Awards Luncheon on May 3, 2019, at the Hilton Chicago. 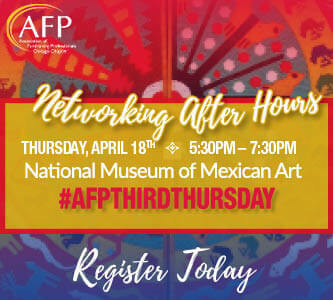 We are delighted to announce monthly opportunities #AFPThirdThursday to network with your peers in fundraising! You are invited to build your relationships and make new ones! These monthly casual events are a great opportunity for members and non-members in the Chicagoland community to meet, network, and hang out. Due to the growing popularity of these monthly meet-ups, be sure to RSVP and reserve your spot. Space is limited! Our special guest speaker will be Tony Martinez, Jr., President and CEO of Oak Park-River Forest Community Foundation. AFP Chicago is a welcoming community of fundraisers. Get connected and build one-on-one relationships with like-minded professionals. As a member, you can access educational opportunities, discounts to events and publications and share your experience and insights with others. Membership has its benefits!